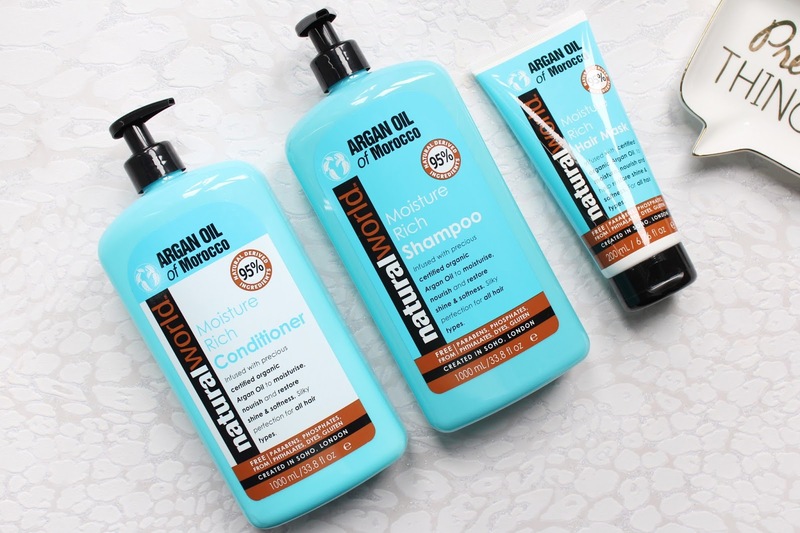 Last year I used a few of these products from Natural World on my hair but they have been revamped and I am so happy with the upgrades! I am always looking for the best hair care products for my hair as it does suffer from damage and I am pretty fussy too! These come in such huge sizes now so they will definitely be lasting me a while! 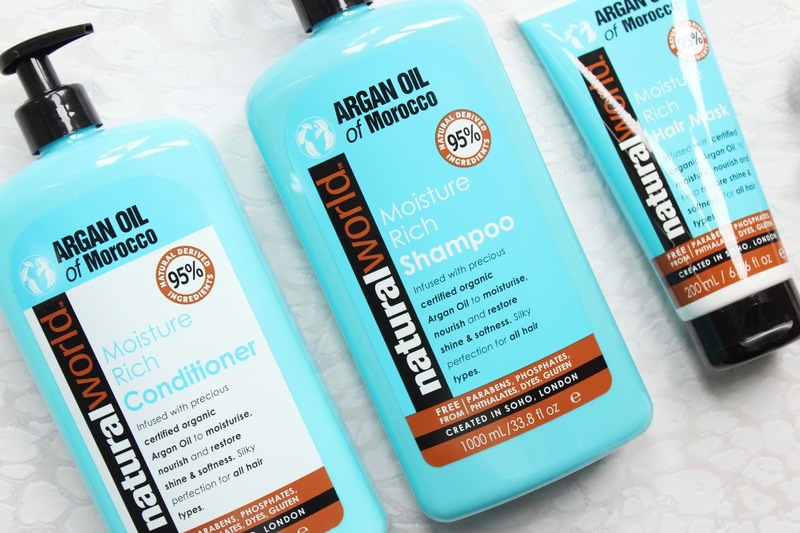 The Natural World Argan Oil Shampoo and Conditioner are now available in huge 1000ml sizes. What I love about these jumbo sizes is that they come with a pump so it makes it so much easier and quicker to use the products in the morning. Both of these products are suitable for all hair types while being free from Parabens, Phosphates, Phthalates, Dyes and Gluten. The Shampoo and Conditioner are going to inject moisturise into the hair while being nourishing and smoothing. They both will also help repair the hair while adding softness and shine, I am always looking for products to make my hair soft as it is on the dryer side. What is also worth noting is that with these products they are made 95% natural derived ingredients. I have been using these most mornings and I am a big fan of them. Both of these and the mask have organic Argan Oil but also a blend of four essential oils of Rosemary, Lemongrass, Orange and Ylang Ylang. 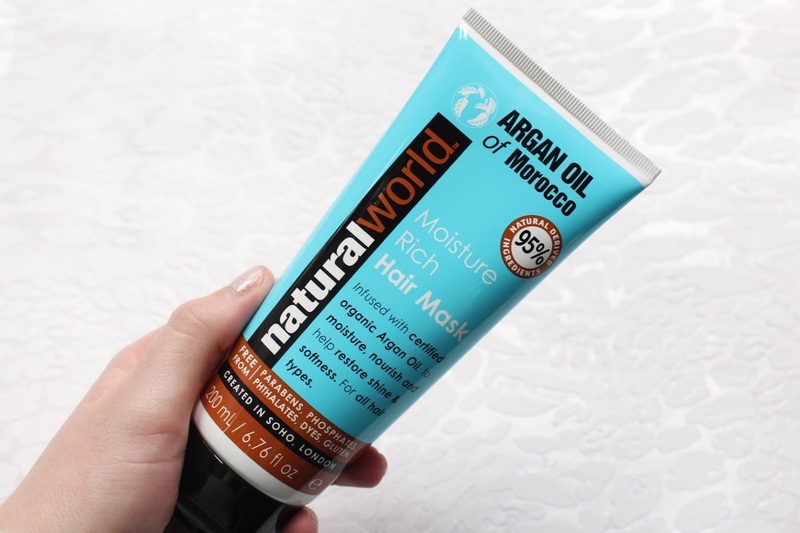 The Moisture Rich Hair Mask has the same benefits of the shampoo and conditioner but with added intensity, I like to use this once a week or whenever my hair needs added moisture. These three products have kept my hair in tip top condition without weighing my hair down or leaving it with residue in. My hair is very frizzy at the moment and these have helped keep my hair smooth and looking as great as possible. I do love the shampoo as it is nourishing on the roots of the hair and adds shine but doesn't leave any residue in my hair which I love. Natural World products are now available at Tesco and each product is under £10 each, the shampoo is just £4 at the moment for a litre! The Natural World hair care products are available - HERE.